The Axiom Streamliner Disc DLX Rear Rack has a low and narrow design for extra stability and aerodynamic efficiency. The sweepback mounting feet help clear disc-brake calipers and attach to frame braze-ons or a rear quick-release skewer, while up top, extra-long Versalock arms mount to seatstay mounts or alternatively, use the included brake-bridge mount for installing the Streamliner Disc DLX Rack on bikes without seatstay braze-ons. Made from double hand-welded 6061 T6 aluminum tubing. Maximum load capacity is 110 lbs. Compatible with wheel sizes between 26" - 700c. Claimed weight is 1.56 lbs. Lifetime guarantee. I was looking for a rack for my new gravel bike that wasn't as wide as previous racks I had owned. This one is perfect-it's burly enough to carry two loaded panniers but it's fairly narrow width wise so as not to protrude far past the frame when not carrying a load. It also looks great. Big fan. Axiom rear rack just right to attach rear light fit my bike perfectly as advertised. 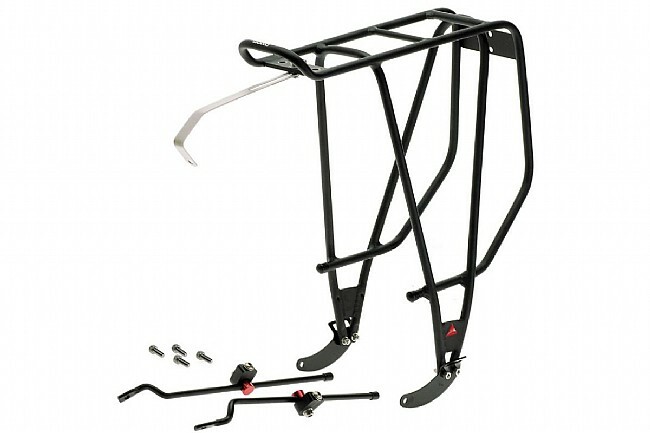 I try to fit a front rack on my e-bike with no good result. So use the rear rack instead, the extra set back helps for heel clearance and fits 700c x 45mm tier with fender on. Great solution for carbon framed bikes. This rack worked perfectly on my Trek Madone 4.2 The off-set skewer bracket does the job getting the paniers far enough back to keep them out of the way of your shoes. Having the weight carried by the skewer resolves potential problems with the carbon frame.